Card Text Play: Stun a creature. Can I target creatures that are already stunned with Smaaash’s “Play:” ability? Yes. However, because an already stunned creature cannot become stunned again, no additional stun card is placed on the creature and the ability is resolved with no effect. 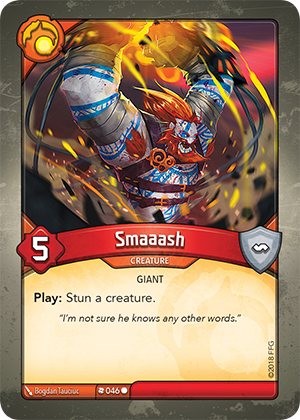 If there are no enemy creatures in play when I play Smaaash, do I have to stun a friendly creature? Yes. You always resolve as much of an ability as possible. If there are no enemy creatures to stun, you must stun one of your own. If Smaaash is the only creature in play, it stuns itself.